Shopping for shoes, booking flights or buying concert tickets on the Internet: Internet shopping is getting more and more popular in many areas of e-commerce. The customers are demanding and don´t want to give up their favored method of payment. Payment on account, payment on delivery, by cash, by wire transfer, by credit / debit card or with various internet payment systems. The growing number of payment systems force shop operators to optimize and broaden the payment process and the offered payment methods. For the merchant the costs of payment processing are critica and most importantly. These costs can be subclassified in transaction-related costs and transaction costs. For example costs which occur for every transaction and costs which occur for the procurement of technical equipment and software such as credit card terminals. Which payment system is suitable for my store? Merchants have to bear in mind and watch, that the costs for each payment method are a key to key to profitability. They are therefore a key criteria for store operators. Offering a multitude of payment methods can be expensive when accumulated. 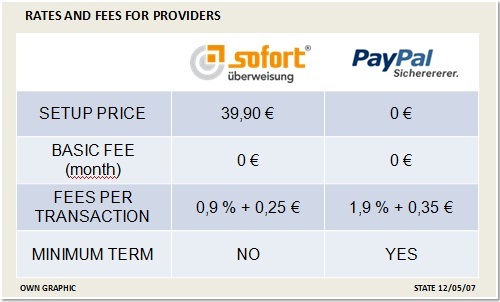 Different payment providers charge different fees depending on their specific model. For example transaction costs can be composed of a fixed amount and a varying percentage of e.g. 0-5 % and / or monthly packages which a paid in advance. Depending on the payment providers, there are also different contract periods with shorter or longer periods of commitment. Since 2012 eBay's subsidiary company PayPal is testing a mobile payment system which works with a compact reader for credit cards: “Paypal Here”.Paypal currently charges 2.7 % of the total bill. Product launch in Germany still open.1). The direct competitor Square is charging 2,75% per swipe for all major credit cards with no additional fees. “Amazon Payments” could benefit especially smaller shops. Confidence in Amazon is comparatively high in comparison to other payment providers and customers are already registered with Amazon, so that they do not have to register with another new payment system. This is an advantage for suppliers and customers. The market for stationary, online and mobile payment is developing rapidly and prices are falling. Merchants are therefore advised to keep a close eye on the payment trends and to gather information on upcoming payment providers and services in order to be able to offer the most attractive and cost efficient payment methods to their customers.